Spring has sprung around the farm—flowers are starting to bloom, buds are popping on the trees, birds are chirping, and we are busy planting for the upcoming season. The winter is finally behind us and all of our plans are taking life as another season begins. There are a lot of things happening around the farm, and it is time I share all of the exciting news! The old fashioned varieties of narcissus, or as Reggie always calls them “Daffy-Down-Dillies”, are the first blooms to appear in the early spring months. Their bright faces against the dreary grey always gives me promise that more flowers will soon start to bloom. They are a reminder that it is time to start sowing seeds for summer crops and directly planting in to the ground ones that can survive a potential spring freeze. Sweet pea starts have been planted along their trellis, and after two failed seasons, I am determined that this is the year we will have an abundant crop. Along with sweet peas, the four varieties of trial Larkspur have been direct seeded, and in the greenhouse (that's right I said greenhouse—more to come about that in Wednesdays post) I planted several dinner plate Dahlia varieties, including hundreds of the all time favorite- Cafe Au Lait. By the end of May almost everything will be planted outside since our grounds are usually free of a frost by then. 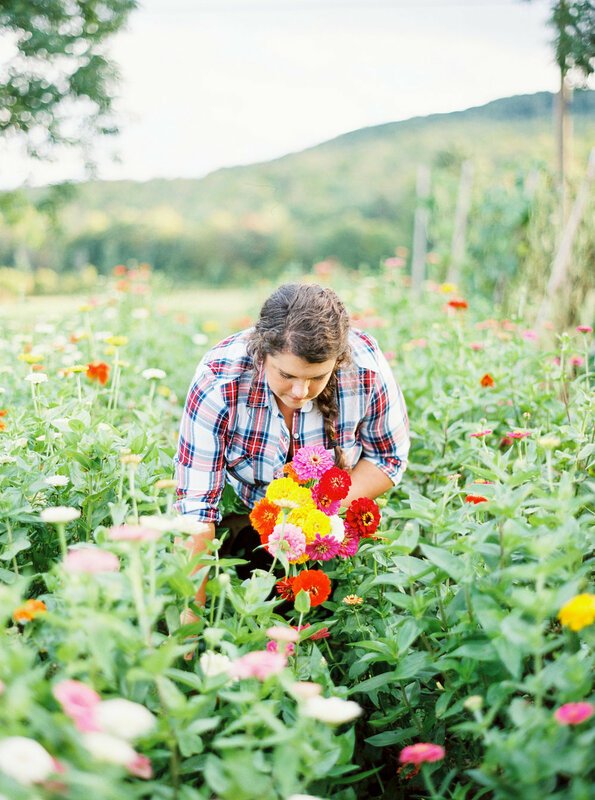 This season the fields will be overflowing with hundreds of peonies (I am excited about our new girl, Coral Sunset), snap dragons, zinnias, sunflowers, dahlias, and the new trials of lisianthus and eucalyptus are looking like they will be a promising crop. I am excited to announce our opening date for the season! We will be opening with limited spring bunches starting Memorial Day weekend, Friday, May 26th. You can stay up to date by following us on Instagram and Facebook . In the weeks to come I will be posting about last summers accomplishments including several exciting publications, the launch of our new and improved website, flower travels, and the most anticipated of all— our first greenhouse being built. Stay tuned in our three piece blog series starting this Wednesday! On a final note, I want to remind our readers that the CSA sign up is coming to a close at the end of this month. We only have 3 remaining shares available, and it is on a first come first serve basis. Easy sign up online—it only takes a few minutes! Remember, this is a great gift for mom and Mothers Day is just around the corner! Give her the gift of flowers all summer long! I hope you stay tuned and enjoy everything I have to share about my father and I and our ever growing flower farming adventure! click here to stay in the loop!